Just quickly wanted to share some of the handmade Christmas Cards I received this year. This is a piccie of all of them placed beautifully on my sideboard followed by a few close ups. Now I got another card .. well it's more of a 3D item but it didn't fit on the sideboard. It had it's own special place. Is this not just TOO gorgeous!! It's from Belinda and she not only made me all these boxes and the very beautiful Accordian Card but she made one for Francie as well. How spoilt are we! Thank you so much Belinda ... it will be coming out every Christmas now as part of my Chrissie Decs! MERRY CHRISTMAS TO EVERYONE WHO POPS IN TO VISIT MY BLOG. 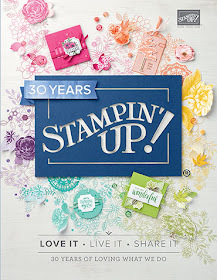 Well here's a first ... Stampin' Up! is holding an Inventory Sale. There is a selection of stamps and accessories selling at a once only special prices and are available only while stocks last or till January 24th ... which ever comes first. Some sets are half price! Amazing bargains! All stamp sets are square cut only so you will need your craft and rubber scissors to trim them. You can view the selection on offer by clicking on the image below. Contact me to place your order today and to ensure you don't miss out. Every year I make one special card for a friend. Lynne and I have known each other since we were about 17. This year, I have made her a diorama card that I cased from Mel Stampz. Mine is slightly different ... because I couldn't find the little houses paper that Mel used. The Christmas Trees are from My Minds Eye and the houses are from KI Memories. 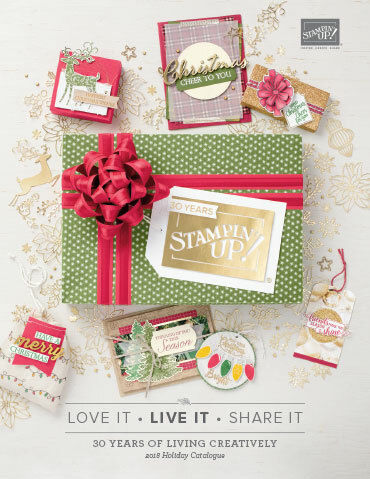 Seasons Greetings is from Stampin' Up! ... Many Merry Messages. It's going to be very hard for me to give this card away ... but I will! Last Saturday was the Stampin' up! Brisbane Regional the last for the year in Australia. It was a relaxing fun filled day with lots of interesting speakers, fabulous demos by some of Queensland's very talented SU demonstrators, a lovely lunch and catching up with friends. At these events we always make some swap cards and here's what I came up with this year. These are based on Scraplings but mine are acutally larger, they are more like a bookmark really. I ended up making 30 of them to exchange. It's a bit hard to see but I've used the fantastic new Butterfly punch from Stampin' Up! currently available in the newly released Summer Mini. Card stock is Pumpkin Pie, Ballet Blue and Whisper White. The butterfly is three dimensional and this is the part that's hard t see. I've actually stamped up acetate on some of the cards and punched out a butterfly shape. Stamps sets are Butterfly Prints, Flight of the Butterfly, Swirl is from Season of Joy and the background is En Francais. ... can't remember where the little flower is from. Ink colours are Cameo Coral, Pumpkin Pie, Ballet Blue, Always Artichoke and Stazon White. Ribbon is 5/8" Ballet Blue and Linen Thread. I received some lovely swaps in return and hopefully ... when I get around to it ... I will take a photo of them. Well it's officially SUMMER here in Australia! I have to say that it is a very pleasant temperature here at the moment around 23 degrees but over the last few days it has been up in the range of 34 degrees Centigrade, that's up around 93 degrees Fahrenheit ... how pleasant .... NOT!!! So summer came a little early this year but then it always done and this is only the beginning! 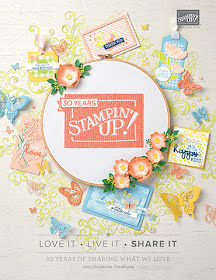 Along with arrival of summer comes the new Stampin' Up! Summer Mini. How pretty is the cover! If you would like a copy of your very own, please contact me or if you click here to view all the lovely images online. As always, you can also email me if you would like to place an order. Well it's official ... Christmas is definitely on the way. It's the first of December and tonight Chelsea and I put up our Christmas Tree. The family room is still a mess and will be until I leave this computer and go clean it up. No picture of the Christmas Tree yet ... it's just the same as last year .... but it looks just as magical ... I do love my tree. Isn't it cute! 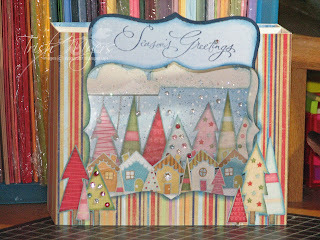 I've used papers from Holiday Treasures and the card colours are Baja Breeze, Whisper White and Chocolate Chip. Punches were Eyelet Border,Star and Large Star and Curly Label. The greeting is also from the Curly Label stamp set. Ink colours are Old Olive, Ruby Red and Chocolate Chip.